ENTHRONEMENT: Sen. Ramon Bong Revilla, Jr., (far right) poses with (from left) Gov. Datu Teng Mangudadatu, Congw. Lani Mercado-Revilla and former Cong. Sultan Pax Mangudadatu after his enthronement as a Sultan last June 25. 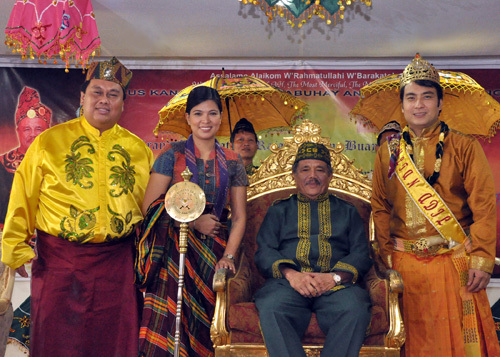 The senator was conferred as Sultan Aadil or Prince of Justice of Sultanate of Rajan Buayan IV in Mindanao for his efforts to alleviate the plight of Muslim Filipinos and promote the further development of Mindanao. His investiture as Sultan also bestowed his lawmaker-wife the honorary title of Bai or Princess.